SOF News Update 20181022 – SAS legend of WWII, Ge Raziq – RIP, Afghan elections, ‘Warriors Wanted’ video, SEAL in brig, US general shot in Afghanistan, SOF veterans trending to mercenary work, body armor revisions, Schoomaker on board, Hunter Killer movie review, report on Iran, body armor changes, International Sniper Competition results, USASOC getting lean, female MARSOC candidate leaving the Corps, ATP 3-13.1, and more. SAS Legend of WWII. Blair “Paddy” Mayne was one of the pillars of the early Special Air Service during World War II. While he had the qualities of a brave SAS operative he also had some personality issues as well. Read “Paddy Mayne: An SAS Legend and a Dangerous Cannon”, History Hit.com, September 19, 2018. Navy SEAL in Brig. A SEAL has retained two lawyers to fight charges the Navy has brought against him – allegations of murder of an ISIS prisoner. (Navy Times, Oct 20, 2018). Schoomaker on Board. A former Army Chief of Staff has joined the MAG Aerospace Board of Directors. Peter Schoomaker brings a wealth of defense experience to the corporation. (Cision PR Newswire, Oct 9, 2018). USASOC Getting Lean. No . . . it is not a weight loss program. The United States Army Special Operations Command is teaming up with Lean Six Sigma to reduce waste in the work place by changing organizational culture. Read “USASOC aims to get lean”, Army.mil, October 11, 2018. Female MARSOC Candidate Leaving Corps. The first female to complete MARSOC’s 1st and 2nd selection phases has opted to leave the Marines. Although she completed both phases she was not selected to attend the nine month Individual Training Course (ITC). She intends to pursue a Master’s degree in International Relations and join the North Carolina National Guard. Could SFAS, SFQC, and 20th SFGA be in her future? (Military.com, Oct 21, 2018). SAS: Normal People with Specialized Expertise. Ex-SAS leader Sir Cedric Delves says SAS troops were normal people who underwent extraordinary training. (The Times, Oct 20, 2018). SOF Veterans Trending Toward Mercenary Work. The recent story about a US firm hiring SOF veterans to conduct operations in Yemen on behalf of the UAE has sparked some interest in the trend to utilize Private Military Corporations (PMCs). NPR interviews one writer familiar with the topic. See “Report: UAE Hired American Mercenaries”, NPR, October 20, 2018.
International Sniper Competition 2018. The results are in from the seven day competition between 32 teams. For the second year in a row the 75th Ranger Regiment took first place. 1st SFGA placed 11th and NSWG 1 placed 25th. Teams from Ireland, Australia, UK, Germany, Israel, New Zealand, and Netherlands participated as well. So . . . it seems the Coast Guard and three Army National Guard teams out shot the Green Berets, Marines, and SEALs. 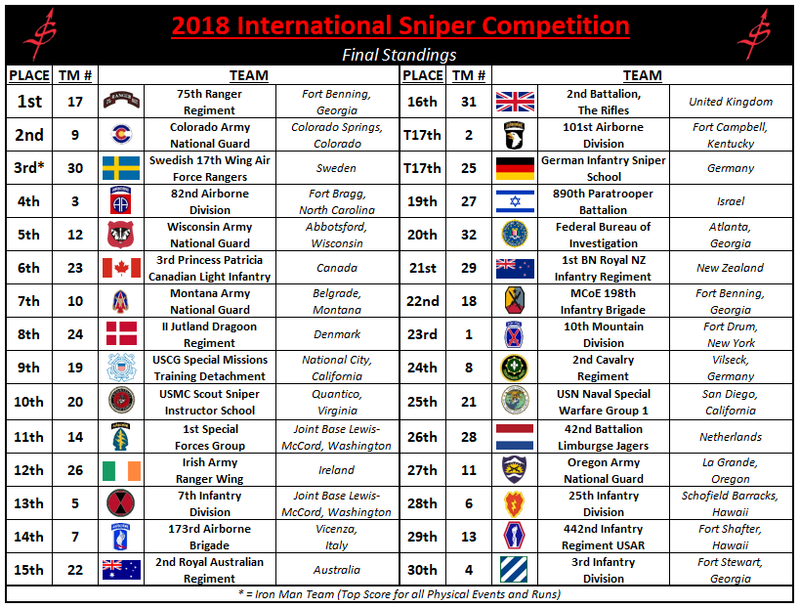 See the standings of all 32 teams in the International Sniper Competition 2018. Body Armor to Weigh Less. The Army may move to adopting body armor that provides less coverage and protection but that weighs less and allows more mobility. See “Army Eyes Narrower Body Armor to Shave Off Weight”, Military.com, October 9, 2018. ATP 3-13.1. The Army has published The Conduct of Information Operations, an Army Techniques Publication (ATP), dated October 2018. This 118 page pdf has several chapters on IO. Iran CRS Report. The Congressional Research Service has published a 69-page report entitled Iran’s Foreign and Defense Policies (Oct 9, 2018). Some of the topics include policy motivators, instruments of national security strategy, nuclear and defense programs, countering Iran’s malign activities, and regional interests. Reflecting on Gen Raziq. Jonathan Addleton, a retired Foreign Service Officer, spent time in southern Afghanistan where he met regularly with General Abdul Raziq – killed in an insider attack on Thursday, October 18, 2018. Read his thoughts on Raziq and how his death will affect Kandahar province. See “Opinion: Bloody Week in Afghanistan Brings Back Memories of Never-Ending War”, Global Atlanta, October 19, 2018. U.S. General Shot in Afghanistan. BG Smiley, the commander of Train, Advise, and Assist – South (TAAC-South) based in Kandahar was wounded during the insider attack that took place on Thursday, October 18 on the compound of the Kandahar governor. LTG Abdul Raziq and the provincial intelligence chief (National Directorate of Security – NDS) were killed as well as three other members of the Afghan security forces and a Afghan cameraman for a government TV network. The shooter, a member of the governor’s protective detail, was killed. Three Coalition members were wounded. The Resolute Support commander, General Scott Miller, was attending the meeting as well. He was not injured although press reports say he was shot at but his body armor protected him. Miller, along with members of his PSD, drew their weapons. Parliamentary Elections. For the third time since 2001 Afghanistan has held elections for members of parliament. The event took place on Saturday, October 20 and was historic in one sense yet disappointing on many levels. It was marred by inefficiency, ineptness, corruption, and violence. Many polling stations did not open on time. The electoral staff were untrained. Biometics systems, in some cases, did not work. Turnout was good in the urban areas, poor in the rural areas – especially where the Taliban control or contest the terrain. Who We Are, U.S. Army, October 18, 2018. The Army is gearing up with a new recruiting campaign. It is part of its “Warriors Wanted” pitch that features short, digital ads on social media and cable TV aimed. This ad depicts 75th Ranger Regiment soldiers fast-roping out of helicopters into an urban setting. Hunter Killer – Movie Review. A submarine with US Navy SEALs have to rescue the Russian president from Russian generals. Good action movie – according to the reviews. (Metro.co.uk, Oct 19, 2018). Photo: Combat Diver trainees do morning PT at the Special Forces dive school at Key West, Florida. Photo by USAJFKSWCS, June 5, 2018.